This topic contains 7 replies, has 4 voices, and was last updated by Dale Wachholz 07/05/2018 at 6:17 am. 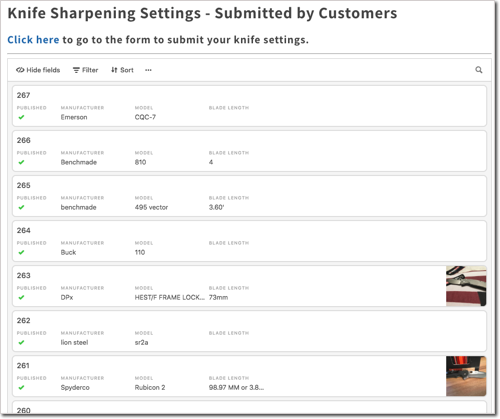 For those not familiar with it, in the past we’ve provided a database of user-submitted sharpening settings for specific knives. And, a form for users to submit into it, including a picture of the knife, settings used (angles), and additional info. The database is once again available. Apologies that it disappeared when we moved to our new knowledge base a few weeks ago. This is because its publishing technique (iframe) isn’t allowed by our new knowledge base, and so we needed to set it up as a website page instead. Please visit this knowledge base article, which links to the database and form. We’d love to see frequent submissions into the database, and preferably each submission would include an image. Also, as a spam-prevention measure, we have to manually review and approve each submission, so there is a delay before submissions appear. If you have thoughts on how to improve the database, please post them here, and a) we’ll appreciate it, and b) we’ll seem how many of the improvements we can implement over the long term. Working to make knife.wickededgeusa.com a great forum! Thanks for bringing this back, Chris. I just looked at what information is requested for user input. I’m not really sure what’s being requested in the fields: Setting 1 >>>Setting 5 and the fields: Setting 1 Text >>>Setting 5 Text. Could you please expound on these? I think those fields are intended as ‘free text’ entries where you could a) put a quantitive value in the field, and b) explain that value in the corresponding field that allows notes. But, those are legacy fields that harken back to a previous version of the form, and they make not make sense in the current version. Please everyone, send thoughts about the best/most streamlined format for the form. We can try to consolidate the input and then make a one-time update to the form. We do have limitations from the form builder, regarding layout and stuff, but we’ll try to do everything we can. Also, I may open it up to additional moderators of the form submits, just to have more sets of eyes who can review and approve submissions. If you’re interested in that, please PM me. The pay may be low (none) but the hours are bad (nights/weekends). I would love to see an impressions field where the user can share his/her observations on how a particular edge works for the intended use. Not sure how that would work unless later additions can be made. Drew I believe there are enough fields on the form to allow for you to add your impressions and any thing else you want to. Go to Knowledge Base, (very top right of browser window) , then click “home” then “knife sharpening settings” submitted by customers, then “add your own sharpening settings”. If you look over the submission form you’ll see they’re able fields to use it how you choose to. Any helpful info is appreciated. It appears, I believe, not all the fields of information transferred over from the old data base. The old records look less detailed then I remember them. I may be wrong. Idea… We should add a field to link to youtube videos, or other video hosting, as I do see a lot of people post knife-specific videos. And then you take your settings (angles, progression, etc.) and add that to the form.